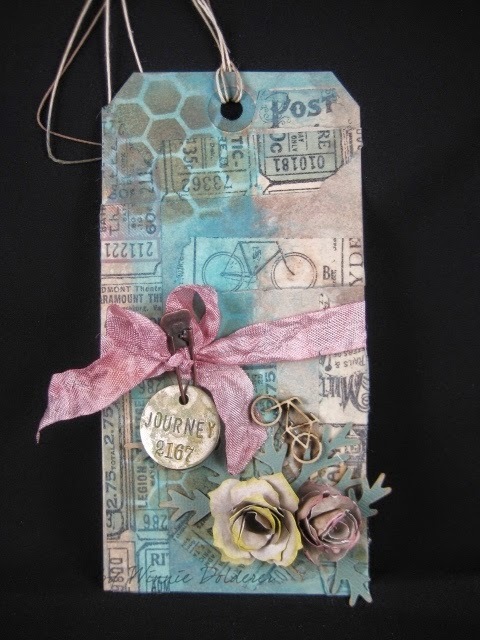 Last month (March) was the only month where I didn't have time to do my monthly Tim Holtz Tag! I have been doing them for years but life got in the way. Today I am sharing my April Tag with you that I got to work on yesterday. For this tag, I got to use my pine cone die to make roses and I love that I can get more than one use for that die. This was a lot of fun to make. I used my Distress Inks, Distress Paints, stencils, and lots of Tim's tissue tapes. One of the best things about taking part in this monthly challenge is sitting down and using your supplies and stretching your imagination to make something along the lines of Tim's creation. I went with a Journey theme. Since spring is here, people are riding bicycles again, and when I noticed the bike image on the tape, I thought "Journey" and even included a wooden bicycle from my stash. Later in the week, I will be sharing my overdue March 2014 tag. It is almost done and drying! If you haven't tried making one of these tags, I would highly recommend you visit Tim and give it a shot! It is a lot of fun and you learn so much. Gorgeous tag take! Love the soft pastels! Elvis - In the Jungle Room? Tea Time Tuesday - Hoppy Easter!